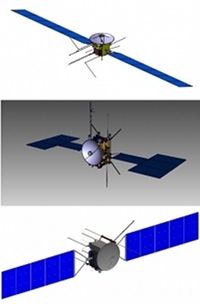 The baseline mission configuration for EJSM-Laplace includes two spacecraft: the Jupiter Ganymede Orbiter (JGO) and the Jupiter Europa Orbiter (JEO). EJSM-Laplace will use these two orbiters to conduct unprecedented detailed studies of the giant gaseous planet Jupiter and its moons Europa, Ganymede, Callisto and Io. ESA's responsibility will be to build, launch and operate the Jupiter Ganymede Orbiter; NASA's responsibility will be to build, launch and operate the Jupiter Europa Orbiter. The following features of the EJSM-Laplace mission define the JGO spacecraft design. The need to carry a significant amount of propellant for the Jupiter orbit insertion and manoeuvers in the Jovian system results in high wet-to-dry mass ratio of about 2.6. The requirement to use solar array power generation in combination with the large distance from the Sun results in a large solar array area of about 60 – 75 m2. High radiation levels at the distance of Ganymede's orbit require specific protection measures for both spacecraft sub-systems and instruments. The thermal design should be able to cope with the range of solar fluxes encountered during the mission, from 2600 W/m2 during the Venus flyby to 46 W/m2 when the spacecraft is in orbit around Jupiter. The requirement to return 1 Gbit of science data per 8 hours of telecommunication pass translates into a high gain antenna of ~3 m in diameter, close to the maximum that can be accommodated under the Ariane-5 faring. The antenna will be also used as a "parasol" during the part of cruise phase in the inner Solar System. Payload accommodation onboard JGO should take into account the need for radiation shielding and satisfy requirements from individual instruments. The payload can be subdivided in two major groups: remote sensing instruments with bore sights pointing in the same direction, and an in-situ package for plasma and field investigations that shall be placed on the ram side of the spacecraft (facing the direction of travel) during the measurements. In addition, several booms for magnetometer and Langmuir probes, and radar antenna will be deployed. JGO and JEO will be operated independently in the Jovian system but the mission is designed to execute an extended choreographed exploration of the Jupiter system, after which the two spacecraft settle into orbit around Ganymede and Europa, respectively. Since JGO focuses on Ganymede and Callisto, it can stay outside of Jupiter's main radiation belts. JEO, however, will be exposed to a greater radiation dose as it explores the inner Galilean satellites Europa and Io. This translates into differences between the spacecraft in terms of protection of the electronics, the power systems, and the payloads. JGO can use shielding as the primary protection for its electronics, however, the JEO design levels are much higher than is practical for standard parts and shielding. Therefore, all electronics on JEO will be designed with high radiation-tolerant electronics to minimize the required shielding, with some electronics and detectors utilizing spot shielding to reduce the radiation exposure. Due to the lower radiation exposure, JGO is able to use solar arrays to provide electrical power, with GaAs solar cells optimized for 'Low-Intensity/Low-Temperature' conditions. JEO will use radioisotope power sources instead.